Hundreds of thousands of Minnesotans live in areas where they don’t have access to essential groceries. Things like fruits and vegetables, dairy, whole grains, lean meats and poultry aren’t nearby either because the nearest grocery store is too far away or it doesn’t have the ability to stock the healthy foods they want to eat. Eating well is key to good health, but too many communities lack access to good foods. 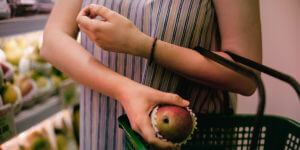 Who is hurt by poor food access? Approximately 235,000 Minnesotans live more than 10 miles away from a large grocery store or supermarket. More than 340,000 Minnesotans face both distance and income as a barrier to obtaining healthy, affordable food. That’s a little more than the population of Saint Paul! And the problem is getting worse: 53 of 87 Minnesota counties saw a loss in the number grocery stores per 1,000 residents between 2007 and 2012. So far, retailers in more than 20 communities have received grant funding, improving access to good food and spurring economic development. You can read more about their impact here. Despite this progress, food access challenges still exist in Minnesota. Without a new investment this legislative session, funding for the Good Food Access Fund will run out this year and the program will not be able to keep helping retailers make healthy, affordable foods available in their community. The Good Food Access Fund is seeking a $2.5 million investment this year. This re-investment will help continue the grant program and reach more communities throughout the state. On February 5, legislators in the House Agriculture and Food Finance & Policy Division will hear a bill that would help address Minnesota’s food access challenges by reinvesting in the Good Food Access Fund.